Arnold Blackgoat Kingman "Black Web" Turquoise Bracelet size 6 1/2"
We first began buying simple pieces from Arnold Blackgoat in the mid-nineties; barrettes, belt buckles and ponytail covers. Early in his career he specialized in such items buffed to a high polish. Now he is showing his experienced skills through original designs characterized by his excellent workmanship. This sculpted-edge bracelet is beautifully stamped with traditional Navajo motifs in stunning combination. Arnold set this oval of natural, untreated Kingman "Black Web" turquoise in a smooth bezel wrapped with raindrop wire. The terminals are nicely rounded for comfort and fans of stylized eagle feathers highlight this roundness. 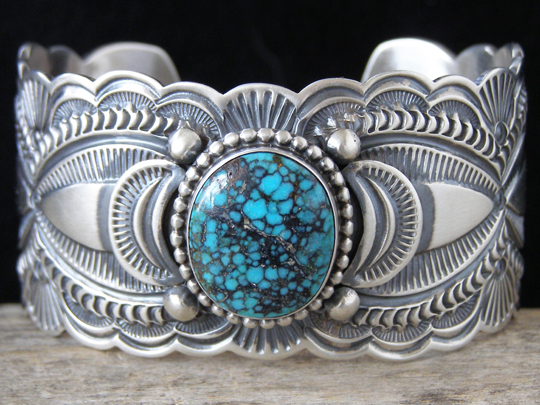 This bracelet exhibits design elements often seen in traditional Navajo belt buckles and would be the perfect companion piece to a fine Navajo buckle. This is an exceptional design which is perfectly executed. Hallmarked BLKGT and stamped Sterling inside. Width of cuff: 1 5/16"
Total inside circumference (including gap): 6 1/2"